Vanessa Foucart at Peri Yachts France sends word that the 29m motor yacht Quasar has relocated to Antibes and will be on display at the Antibes Yacht Show in April. Delivered by Peri Yachts in 2009, this superyacht is RINA classed and MCA compliant, sleeping eight guests in two double and two twin cabins. 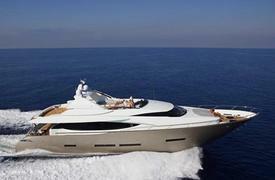 Quasar is asking €3.45 million.